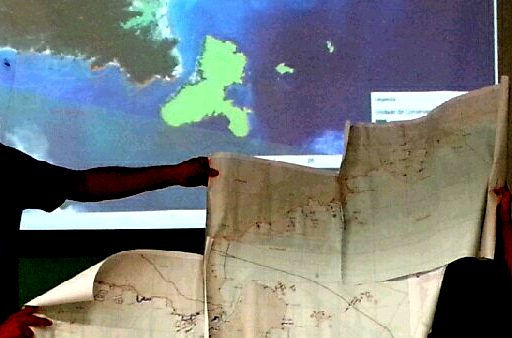 The visibility, use, durability and interoperability of geo-referenced data produced about the Ubatuba territory has been a challenge for projects working in the area. The free and open availability of geo-referenced data in the region is crucial to promote social participation in ongoing processes in the territory, such as the revision of Ecological-Economic Zoning (ZEE) in the region. Although many projects make maps available on the internet and present them in events, rarely do these initiatives share this information in an open and structured way, which would allow for the reuse, cross-breeding, and public checking of the information. Even those wishing to do so end up facing barriers of technical, resource or knowledge. IBICT hosted a workshop on geo-referenced data on May 20, 2016 in order to promote the exchange of experiences on producing and using such information and sketch out strategies for sharing data and knowledge accumulated by various initiatives. As an output from the workshop, the formation of a work group was suggested, in order to develop prototypes using free/open software such as GeoNetwork and GeoServer, while starting to build a longer term project that allows the permanent availability of shared data, possibly by establishing a consortium of institutions that could apply to join INDE, the national infrastructure. One of the recurring issues that the Ciência Aberta Ubatuba platform has been facing is related to the visibility, use, durability and interoperability of geo-referenced data produced about the territory. The free and open availability of geo-referenced data in the region is crucial to promote social participation in ongoing processes in the territory, such as the revision of Ecological-Economic Zoning (ZEE) in the region, the Plan for Hydrographic Basins and the Management Plan for APAMLN (Marine Environmental Preservation Area on the Northern Coast of São Paulo State). Different projects often put their efforts into collecting and organizing this information for various purposes. Sometimes, they share the results among themselves, make maps available on the internet and present them in events. However, rarely do these initiatives share this information in an open and structured way, which would allow for the reuse, cross-breeding, and public checking of the information. Even those wishing to do so end up facing barriers of technical, resource or knowledge. Aiming to promote the exchange of experiences on producing and using such information, as well as sketch out strategies for sharing data and knowledge accumulated by various initiatives, we organised a workshop on geo-referenced data. We invited people interested in these issues, as well as professionals whose experience would add to the construction of local strategies for sharing open geo-referenced data, with a focus on the northern coast of São Paulo. The workshop took place on the 20th of May 2016, in Tancredo Neves school (Ubatuba) and included relevant projects both on local and national scales. The first part of the workshop began with presentations about digital infrastructure for sharing geo-referenced data in Brazil. Hesley Py (IBGE / PhD candidate at IBICT-UFRJ) explained the possibilities of INDE, the National Infrastructure for Spatial Data, a public platform created in 2010 by a consortium of 23 nationwide and some regional organisms, with the goal of enabling the exploration and sharing of data generated by various institutions. After him, the Datageo team, from the regional Environmental Authority of the State of São Paulo (Ana Maria, Edgard Joseph and Igor Redivo) presented the Datageo portal, and brought about some reflections on how to promote the dialogue between “old” systems and new technological possibilities. Then, the experiences of three institutions whose activities encompass Ubatuba’s territory were presented. Gabriela Sartori, from APAMLN, spoke about building cartographic information together with local communities, as well as drawing attention to particularities stemming from working with maps on the marine environment. Fabio Pincinato, from CBH-LN (Northern Coast Comitee of Hydrographic Basins), reported on the ways in which many projects end up sharing data, often very informally. He pointed out that one thing missing was a “web server” to allow data sharing. Pedro Chaltein, from OTSS (Observatory of Healthy and Sustainable Territories in the Bocaina region), pointed out the relevance of establishing a closer relationship between geo-referenced data and social cartography, and how these resources can help qualifying processes of territorial disputes amongst the region’s traditional communities. The second part of the workshop was an open discussion aiming to delineate collective strategies for the sharing of geo-referenced data. The formation of a work group was suggested, in order to develop prototypes using free/open software such as GeoNetwork and GeoServer, while starting to build a longer term project that allows the permanent availability of shared data, possibly by establishing a consortium of institutions that could apply to join INDE, the national infrastructure. As an immediate proposal, the group proposed to meet again two weeks later to organise action plans. Some issues to be faced by this initiative were singled out: modes of adhesion, institutional and governance settings; integration or compatibilization of standards; web infrastructure; metadata compatibility.